On June 15, 2018, new real estate rules came into effect that change how REALTORS® and their clients can work together in different circumstances. These rules state that real estate licensees across our province can now only represent one party in a transaction and must provide additional documentation about representation and compensation. So, the next time you go to buy or sell a property, your Realtor is required by the government to go through some additional forms to explain how or whether you’re being represented and to clarify the compensation that you’ll pay. Of course, Realtors can still give factual information about the properties they list for sale without providing you with this additional documentation. This, however, would change if you wanted to ask them for advice or to reveal any personal information, e.g. your situation; what you’d like to buy or sell, why; etc. There may also be times under the new rules when your Realtor is unable to represent you because they’re already representing another client in the transaction. In these situations, there are some options you can consider, and a Realtor would be happy to explain them to you. While the new rules create a little more paperwork for both you and me, I think they are an excellent move overall. Even before the rules were implemented, I never once put myself in a position where a major conflict of interest arose: such as Limited Dual Agency. Always feel free to ask me more about these new rules. This form is in no way a contract between me and you. If you have previously bought or sold a home, you may remember signing the Working With A Realtor® form. The main form "Disclosure of Representation in Trading Services" essentially replaces the old Working With A Realtor® form. The form is simply the required paperwork from the Real Estate Council of British Columbia. The Disclosure of Representation in Trading Services form is just an acknowledgement that I've told you about the various forms of agency. I'm not asking you to sign these forms to put you in a contractually binding agreement, it is just the basic required paperwork for me to assist you. If another agent is working for you and has not yet given you these forms, you should know that they are skipping steps and not doing their job properly. You have two main options when completing a real estate transaction, you can either choose to be a Client (you have agency) or to be an Unrepresented Party (no agency). Loyalty: they must put your interests first, even before their own. Avoid conflicts of interest: they must avoid any situation that would affect their duty to act in your best interests. Fully disclose relevant information: they must give you all the facts they know that might affect your decisions. any preferred terms and conditions you want to include in a contract. If you choose not to have a real estate professional represent you, you are an unrepresented party. You are not entitled to the special legal duties a client receives. No loyalty: the real estate professional involved in the transaction are representing clients with competing interests to yours. They must be loyal to their clients, not you. No duty to avoid conflicts: no real estate professional is acting in your interests. No full disclosure: the real estate professionals involved in the transaction do not have a duty to give you all relevant information. No confidentiality: the real estate professionals involved in the transaction must share any information you tell them with their client. Note: if you choose to be an unrepresented party and are completing a transaction with me (most likely to occur when you are a buyer without an agent, and I am assisting the seller). I still need you to sign the Disclosure of Representation in Trading Services form, as well as another form called Disclosure of Risks to Unrepresented Parties. I also encourage you to find representation with another agent; alternatively, I am also happy to refer you to another colleague of mine. The 5 coolest properties I viewed in 2016! Where to Buy If You’re Looking For A Studio, 1-Bed, or 2-Bed Condo? My post today specifically analyzes sales and sales prices for studios, 1-bedroom, and 2-bedroom condos in Vancouver and it’s surrounding areas. There has been much speculation about how this portion of the market will react due to the 15% foreign-buyers-tax and increased restrictions on the mortgage market. The market for a studio, 1-bdrm, and 2-bdrm condos is also an important market as many first-time buyers will be looking in this market. For the analysis of the charts, I have included all price ranges. If I were to exclude the upper price range for these condos, I’d overlook properties that were once within a range and have increased as to be out of any price range in question. West Vancouver is excluded due to a lack of data in this segment of the market. Sales are down in all areas since earlier this year. 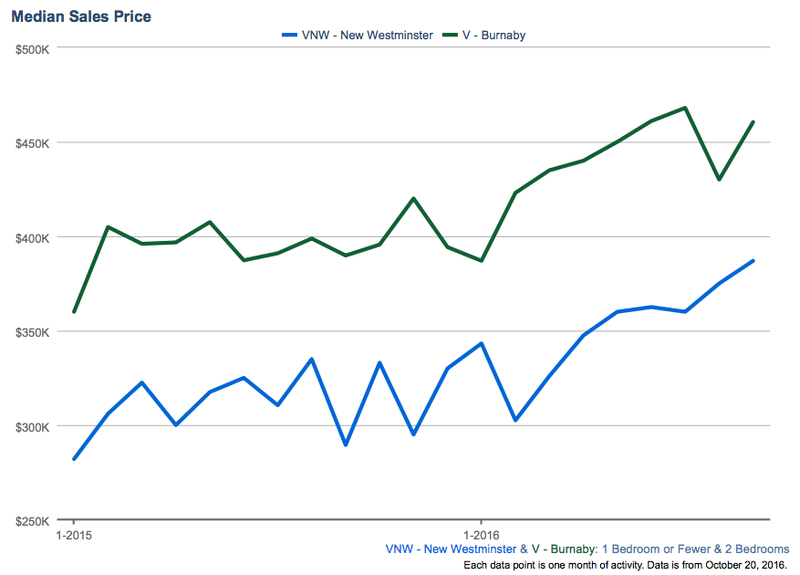 While sales are down in all areas, prices continue to rise in North Vancouver, Burnaby, and New Westminster. All of these markets appear to be relatively safe choices with localized pockets of economic growth. Burnaby and New Westminster have seen steady price increases stabilized in part due to the opening of new Evergreen Skytrain line opening up in that area. North Vancouver continues to grow and be stable in this market, with heavy levels of ongoing development in North Vancouver. North Vancouver also has the added stability in the studio, 1-bdrm, and the 2-bdrm market as many of the buyers in this market are North Shore raised and specifically want to purchase on the North Shore. Vancouver itself has seen a slight decline in sales prices since earlier this year, though nothing too substantial. Vancouver itself will inevitably go up over the long-run, though clearly many buyers are waiting to see what happens in the short-term market. The tradeoff for many buyers in the condo segment of the market will come down to how much rent they will pay during the time of this slight market instability. I am looking for a new place in the West End and wouldn’t hesitate on the right place at the right price. I feel that there are many good deals to be had while other buyers are waiting on their decision to see what the market does. Richmond has taken a particularly steep decline in prices in the last three months, though is still up overall from a year ago. I would be particularly cautious of this portion of the market for the next few months and certainly, seek expert advice if you’re on the hunt. As with the Vancouver market, there are good deals to be hand, though the risk/reward is amplified in the Richmond market. Due to the massive foreign investment in the Richmond area, it is no surprise that Richmond has been hit quite hard by the foreign-buyers-tax. The information provided here is meant to be a recap of current news and does not constitute advice about the market one way or another. It is advised you contact your REALTOR® (such as me) and other sources before making any major financial decision. Last Last December the federal government announced new down payment measures to “Maintain a Healthy, Competitive and Stable Housing Market”. These rules were implemented in mid-February and attracted headlines at the time. The primary change moved the threshold of 5% down payment on properties under $1,000,000, to 5% down payment for under $500,000, with 10% down payment from $500,000 to 1,000,000. Over $1,000,000 the rules in place remain unchanged. As it stands, a 20% down payment is needed on properties over $1,000,000. In addition, you will need your mortgage insured if your down payment is less than 20% of the property value. The stress test was already in effect for high-ratio mortgages (small down-payment or term less than 5-years). As of today, Oct 17th, 2016, the stress test requirements expand to encompass all buyers with insured mortgages. This means that buyers will be tested against the federal 5-year conventional (fixed) mortgage rate (currently 4.64%), rather than a 5-year fixed rate offered by some lenders (as low as 2.14% in some cases). The stress test does not mean that all borrowers now need to pay a rate of 4.64%, but rather that they need to qualify for their loan using this as their rate. The idea is that if the mortgage rate goes up on their loan (say from 2.7%), they will still be able to make payments toward their loan without financial difficulty. There is a good chance you may have never heard of portfolio insurance because it primarily impacts lenders rather than buyers. This is a type of insurance from the CMHC (Canadian Mortgage and Housing Corporation) - a crown corporation. Portfolio insurance effectively gives a bulk discount on mortgages with down payments over 20% of the property value. Along with the other requirements announced, lenders looking to purchase Portfolio Insurance will now face stricter requirements. I view these new requirements positively on the whole. I feel the “stress test” will make the mortgage market stronger and will lower the chance of a mortgage backed housing crash similar to the 2007/2008 housing crisis in the United States. Stricter requirements on portfolio insurance will not have any immediate effect on mortgages, but will mean a small increase on rates in years to come as the stricter requirements translates into a higher cost of business for lenders. There have been mixed reports this week on the future market. Optimism in the news from local sources and experts has been matched with pessimism due to a report from published by UBS. The most widely circulated Vancouver news article in the news this week was the forecast from UBS. The UBS forecast was covered by nearly all top Canadian news sources (The Financial Post, CBC, Globe and Mail, Vancouver Sun - to name a few). The Financial Post reported “UBS Global Real Estate Bubble Index 2016 listed 18 cities around the globe and their risk and found Vancouver with the greatest probability of a bubble.” Articles from the other sources on this subject all follow a similar tune. While the UBS report is certainly a worrying report concerning the Vancouver market, UBS stated that the main factor leading to their conclusion is the incredibly low interest rates available to consumers. Low interest rates are hardly a new thing for the Canadian marketplace. Among other panelists, Pastrick was joined by Tsur Sommerville, associate professor at UBC’s Centre for Urban Economics and Real Estate. Along a similar tangent to Pastrick, Sommerville noted that “In other markets where a foreign buyer tax was introduced, such as Hong Kong and Singapore, prices continued to rise.” Sommerville’s point is certainly an interesting one - so I dove a little deeper into what he is quoted with saying. Hong Kong currently charges 15% tax on foreign buyers and Singapore currently charges 18% tax. Sommerville is certainly correct in his remark that Hong Kong’s real estate market has been relatively unaffected by their 15% tax. I found several articles over the last few years making similar notes of their foreign-buyer tax. Vancity Buzz had noted in November of 2015 that the taxes were “not enough to deter foreign investors... Even after the taxes were introduced, housing prices continued to rise.” Sommerville also made note of the strong millennial influence in the Vancouver marketplace, adding that this group is going to continue to buy and keep the market steady. In terms of current Hong Kong market trends, it appears as Hong Kong has finally experienced some slowing of the market, but it appears to be unrelated to their foreign-buyer tax. Q4 of 2015 and Q1 of 2016 showed the most major slows for the Hong Kong market since the tax was introduced way back in 2012. Other factors seem to be affecting the Hong Kong market in particular. Global Property Guide reported that there was a “sharp decline in the flow of money following the intensification of government crackdowns on the wealthy in Mainland China.” There have also been a handful of other factors affecting the Hong Kong real estate and their economy. In a similar story also published by REW, “Tina Mak, a Vancouver real estate agent and founder of the Vancouver chapter of the Asian Real Estate Association of America, Mak urged buyers to remember the words of legendary investor Warren Buffett: ‘Be fearful when others are greedy and greedy when others are fearful.’” Based on the opinions and recent articles in the news, I feel that Buffett’s words ring true and is sound advice for those looking in the Vancouver market - especially to local buyers looking to get into their first home or condo. If the market does go down in the next few months, the market will quickly recover and it is extremely likely that the cost of housing will only be higher at this time next year. The information provided here is meant to be a recap of current news and does not constitute advice about the market one way or another. It is advised you contact your REALTOR® and other sources before making any major financial decisions. 130 - 1152 Mainland St.